I never thought I would be so trendy. After watching the news, I now see I have missing out on the latest custom to memorialize the passing of a fellow human-Looting. My closest friends (you know who you are) will each receive several Pre-Paid Visa Cards totaling about $500.00. You will be encouraged to dress in your best thug finery and will be transported, via limo, to a few of the local retail establishments. 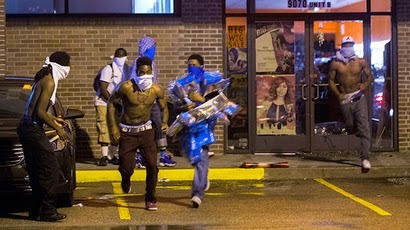 Just imagine the thrill of pseudo looting as you rush and push your way into Spec’s Liquor and grab bottles of premium bourbon and scotch. The uptight suburbanites will give you a wide berth as you dash into the walk-in humidor to cop a handful of Cohiba “Red Dot” Toros. Don’t forget the ice, lots of ice, it’s going to be long night. As you hastily exit, be sure to leave your Visa Card with one of the terrified sales clerks. The limo will take you to Academy Sports & Outdoors. You and your mob will run in and grab as much ammo as you want. You did remember to bring a hand gun didn’t you? You will need a large cooler for all that ice you just looted. The high dollar Nike shoes are in the rear left corner. Disclaimer: Your Pre-Paid Visa Card will not be valid for any Texas Hunting License. Again, throw down the correct Visa card. Time to move on. The last looter’s venue will be HEB Central Market. Your Visa will not be accepted for any health-related food items. I recommend you move quickly and abscond Prime Beef Rib Eyes and for the real ballsy looter, Prime Rib Roast. Then, off to the deer lease for a night of drinking, eating and shooting guns.